Windows PowerShell is Microsoft's shell and scripting language. This short article provides a brief tour of Windows PowerShell and IIS. Reading this article, you gain a solid understanding of exactly what Windows PowerShell is, learn about the relationship between Windows PowerShell and IIS, and discover some of the ways in which Windows PowerShell simplifes performing IIS management tasks. The information presented here is useful to IT administrators, software developers, software testers, and managers. Even the skeptical will be convinced that Windows PowerShell is a must-have tool. Windows PowerShell is Microsoft's comprehensive next generation shell environment and scripting language. 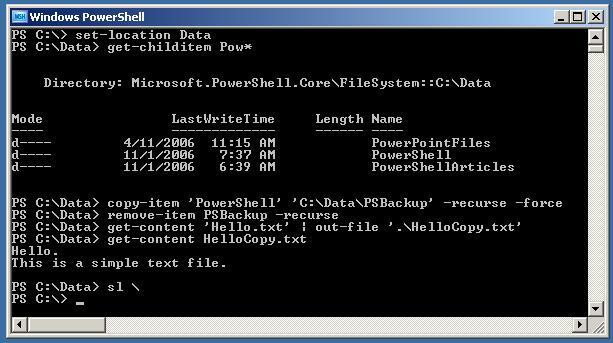 Consider Windows PowerShell as a dramatic upgrade to the old cmd.exe command shell and .BAT files. Users may ask why there is a new command shell, when Cmd.exe works well--and there is no time to learn yet another scripting language. Windows PowerShell is an improvement over previous Microsoft command line scripting technologies--this means that Windows PowerShell is easier to use for both simple and complex tasks, and is surprisingly easy to learn. This section provides concrete examples and highlights a few of Windows PowerShell's features. In the following sections, it then discusses how Windows PowerShell works together with IIS. To get a feel for Windows PowerShell, look at an example. Consider the screen shot in Figure 1. First, notice that the shell in Windows PowerShell looks like a traditional Windows command prompt. Using Windows PowerShell will quickly feel quite natural after a brief ramp-up period. This invokes a Windows PowerShell cmdlet (pronounced "command-let") to change the current working directory from C:\ to C:\Data. This is the functional equivalent of the old cd (change directory) command. You may note that having to type "set-location" every time you change the current directory is too much typing; this is correct. Windows PowerShell has an extensive set of shortcut aliases you can use. The set-location cmdlet is aliased to sl (a shortened version of the full cmdlet name), and to cd (the "old" way). This article uses the full version of cmdlet names for improved readability. This lists the contents in the current directory which start with "Pow". Windows PowerShell is not case sensitive, so you can type Get-ChildItem or GET-ChildItem. This article uses all lower-case. The get-childitem cmdlet is aliased to both dir (for Windows familiarity) and ls (for Unix users), and aliased to gci for ease of typing. Now, if all there were to Windows PowerShell was performing common file system navigation and manipulation tasks using a new set of commands, there would be no point in reading further. A brief, one-paragraph introduction could lead to that incorrect assumption. However, Windows PowerShell has many advantages over many current shell environments. To conclude this introductory Windows PowerShell discussion: Windows PowerShell has a learning curve. New technology is useless unless there is a way to quickly learn the technology. Programmers call this process discoverability. Windows PowerShell was designed with excellent discoverability characteristics, making it much easier to learn. For example, you can get a list of all cmdlets simply by typing get-command at the Windows PowerShell prompt. You can also get detailed information about a particular cmdlet by typing get-help followed by the cmdlet name. Extensive experience teaching Windows PowerShell to engineers and managers shows that most engineers can become adept at using Windows PowerShell with a single day of practice. The previous section of this article gave a short, basic overview of Windows PowerShell. However, a real advantage of using Windows PowerShell comes from the Windows PowerShell ability to interact with and manage IIS. Engineers reading this article might be skeptical of "latest and greatest" claims. This article will shortly show the power behind Windows PowerShell: many IIS management tasks can be accomplished using Windows PowerShell commands and scripts as well as the IIS GUI tools. Those users with significant experience managing server software using shells and scripts do not need any more motivation; but those used to using strictly GUI tools may ask what is special about being able to manage IIS through a command line or a script, when they have managed well enough with MMC. The end of this article points out six significant advantages of managing IIS using Windows PowerShell. The following are some Windows PowerShell examples based on a Web cast featuring Windows PowerShell architect Jeffrey Snover and IIS Product Unit Manager Bill Staples. (Find the Web cast at https://channel9.msdn.com/). Suppose you want to examine IIS-related services running on your computer -- a very common task. One "GUI approach" to do this is to launch MMC and then expand the Services and Application category, and then select the Services category. The result looks like the screenshot in Figure 2. You can interpret this command as meaning fetch all Windows service information but then filter to include just those services that have a name beginning with the letter 'W'; then, sort those results according to the service status (running, stopped, paused). The result looks like the screenshot in Figure 3. The first command, $p = get-process, fetches all the information about processes currently running on the host machine, and stores that information into variable $p. Notice that in this example there are a total of 54 processes running, and a total of 14,750 handles in use, which is an average of about 273 handles per process. The largest number of handles used by a process is 1625 handles. One characteristic of the Windows PowerShell architecture is that Windows PowerShell is easily extensible at all levels by both users and third party companies. Windows PowerShell extensibility is a topic in its own right, and here is but one example. This command produces a floating-on-the-screen, digital-style gauge which displays the total number of handles in use in real time, and updates the display every second. All this demonstrates that a wide range of useful, Windows PowerShell-based tools will be soon available. The net effect is to copy all files listed in file AppManifest.txt, located on machine DemoServer1, to all the machines listed in file RestOfFarm.txt. One feature of Windows PowerShell is that well-written scripts are easy to understand, relative to the alternatives such as VBScript or Perl. The script uses the get-content cmdlet to read machine names from file RestOfFarm.txt and file names from file AppManifest.txt. The foreach loop may be new to you. The outer loop iterates through each machine name stored in variable $farmList, storing each name into variable $targetMachine in turn. The inner loop is similar and stores each file into $file in turn. The join-path cmdlet is used to intelligently concatenate strings to produce complete source and destination paths. Finally, the copy-item cmdlet performs the copy actions, where the -recurse switch copies all sub-directories and the -force switch causes existing files to be overwritten. Notice that this script has all the information about source and destination locations hard-coded into it. Windows PowerShell has excellent parameter passing capabilities, so this example script could be parameterized to accept information from the command line--however, that topic is outside the scope of this article. So far, this article has presented Windows PowerShell examples that apply to any server machine. Now we examine some Windows PowerShell cmdlets that are specific to IIS. Writing custom cmdlets is a topic outside the scope of this article, but this example givea an idea of the kinds of cmdlets you can write and which the IIS community will write. The cmdlet name is add-iiscaching. As mentioned earlier, Windows PowerShell has an extensible architecture that allows the IIS development team to create custom cmdlets which work directly with IIS. The net effect of this command is to enable dynamic caching for page requests with Qwd, Qif, Qiv, and Qis in the query string against a particular PHP application on all the IIS servers whose names are stored in variable $computerlist. Although the main point should be clear -- that IIS you can easily enable a powerful performance improvement using a simple Windows PowerShell command -- the article continues with details of the switch parameters in this example. reads the list of servers into variable $computerlist. The second argument, -path Demo, points to the root path of the application on which you wish to enable caching. In this example, because the path value does not have spaces, it is possible to omit quote characters, although they could have been used like this: -path "Demo". This command launches a GUI control in which the user could specify a user name and password, and the results would be stored into the $cred variable. The fifth argument, -extension .php, specifies the type of application to cache. The sixth argument, -kernelcachepolicy 0, tells the add-iiscaching cmdlet not to cache kernel information. The seventh argument, -itemlocation 0, specifies where to cache response information; 0 means store on either client or server. The eighth argument, -policy 1, means to continue caching until there is a change in the underlying cache element (as opposed to caching for a specified time interval). This article first presented a quick look at Windows PowerShell, Microsoft's new shell environment and scripting language. It showed some typical Windows PowerShell file navigation and manipulation examples and made the claim that Windows PowerShell goes far beyond existing shell environments. The second section of this article demonstrated how to use Windows PowerShell in a typical environment in which IIS is running. The examples included examining Windows services and processes on a host machine. 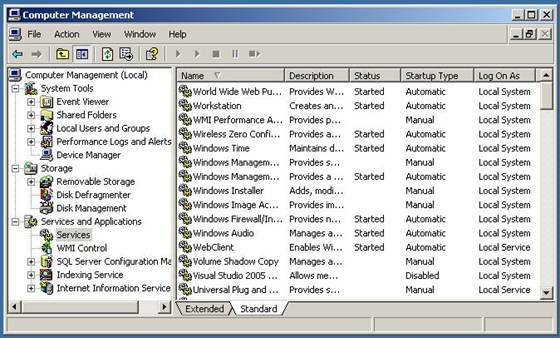 It also promised a list of a few of the advantages of using Windows PowerShell to manage and interact with IIS. Here are six comments on such advantages from early Windows PowerShell adopters. They also include advantages that the IIS Team has experienced. Because Windows PowerShell commands can be stored as scripts, they can be saved and executed unattended. This advantage is true of any scripting-based technique, but Windows PowerShell is significantly easier to use than other existing scripting languages. Because Windows PowerShell commands can be stored and used as scripts, they create a self-documenting record of IIS management activity. How often have you tried to remember how you modified some registry key using the regedit.exe GUI? Compared with using GUI-based management interfaces, Windows PowerShell commands "remove the magic" and let you see exactly what is going on. GUI-based tools are good for lighter management activity. However, using GUI-based tools can lead to thoughts like, "I'm not sure exactly why it works, but when I double-click on this, it usually fixes the problem." Because many other Microsoft server products will be based on Windows PowerShell, every time you use Windows PowerShell commands and scripts to manage IIS, you indirectly get training on other systems. Using Windows PowerShell creates a common management paradigm and means of communication: Windows PowerShell communities are growing quickly and it is much easier to understand documentation or blog entries which are in the form of Windows PowerShell commands than it is to understand documentation which reads like, "Open MMC then click here, then click there, then double-click up there . . ."
Because Windows PowerShell is a comprehensive environment, you can perform the majority of your work in Windows PowerShell. There is no need to constantly jump from a GUI-based program, to a cmd.exe shell, to another GUI-based program. This is similar to the way in which software development activities have evolved from using separate compilers, linkers, debuggers, and so on, to using an integrated environment like Visual Studio. The second section of this paper also showed an example of a Windows PowerShell script which showcases the ability of IIS to deploy Web servers across multiple machines using simple file-copy operations. The third section of this paper explained how the Windows PowerShell design allows the IIS community to create and share custom Windows PowerShell cmdlets which operate directly with native IIS functionality. In particular, it presented add-iiscaching, a pre-release cmdlet which can enable IIS's ability to cache dynamically created pages. Though this article has just scratched the surface of how Windows PowerShell and IIS work together, it should have convinced you that the two in tandem provide an easier, more efficient, and more enjoyable IT management experience. See https://www.microsoft.com/windowsserver2003/technologies/management/powershell/default.mspx for Windows PowerShell documentation and examples, and to download Windows PowerShell. Search https://channel9.msdn.com/ for the Web cast featuring Windows PowerShell Architect Jeffrey Snover and IIS Product Unit Manager Bill Staples, which served as the basis for the article. See https://blogs.msdn.com/PowerShell/ to view useful examples created by the Windows PowerShell team. See http://www.powergadgets.com to learn more about the visualization tools based on Windows PowerShell. See https://www.iis.net for information about Microsoft IIS. Dr. James McCaffrey works for Volt Information Sciences, Inc., where he manages technical training for software engineers working at Microsoft's Redmond, Washington campus. He has worked as a lead engineer on several key Microsoft products including Internet Explorer and MSN Search, and is the author of ".NET Test Automation: A Problem-Solution Approach", Apress, 2006.